An estimated loss of 600-800 litres of kerosene oil. 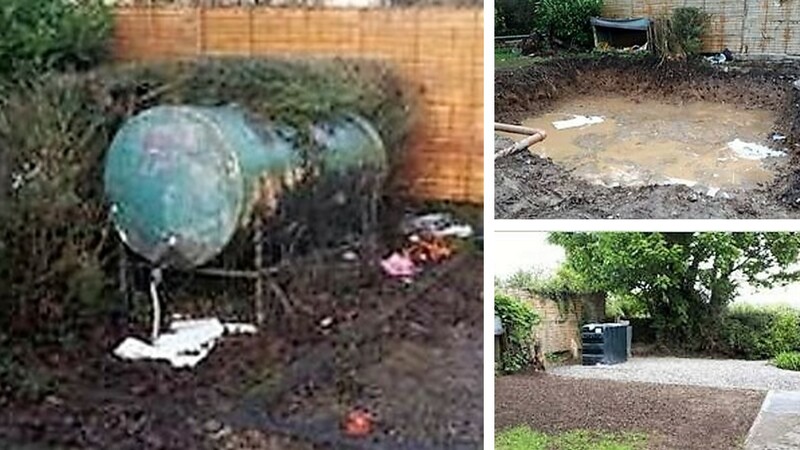 Physical and analytical evidence of oil contamination encountered in soils on surface, beneath and surrounding the oil tank, extending towards the house. Analytical evidence showed elevated total TPH readings of up to 1700mg/kg in soils beneath and surrounding the oil tank. Contamination encountered in close proximity to the boiler. Mild oil odours and elevated PID readings of up to 0.6ppm were recorded in the general air. Elevated PID readings of up to 11ppm were recorded at the floor/wall interface of the kitchen/utility room. Installation of a VEU to temporarily alleviate internal hydrocarbon malodours within the dwelling. Installation of a temporary oil tank and heating supply. Absorption of any free phase surface product underneath the oil tank using absorbent pads. Disconnection and removal of the corroded oil steel oil tank. Removal of a section of hedging to the west of the oil tank. Removal of the concrete pillars, curbs and low stone walls to the south and east of the oil tank. A section of concrete footpath to the rear of the house was broken out and removed. The identified contaminated soil and fill material beneath and surrounding the former location of the oil tank, boiler and removed section of concrete footpath was excavated and removed. Following excavations and the exposure of rising blockwork, Verde carried out further sampling and assessment on the rising blockwork. Specialised chemical and biological treatment solutions were applied to the base and sides of the excavations to treat residual contamination that had migrated into soils at depth. The excavated areas were backfilled using granular sub base material compacted. The former oil feedline was replaced with a new oil feedline. A new concrete oil tank base was installed as per OFTEC guidelines. A new oil tank was installed on a new oil tank base. A new boiler was installed by an OFTEC registered plumber along with the associated pipework. The heating system was re-commissioned. Decorative gravel spread on previous gravelled areas. Topsoil and lawnseed were spread in the previously disturbed areas of soft landscaping.